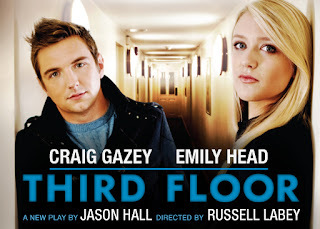 When a young woman (Emily Head – The Inbetweeners) buys her first flat, in one of the ever-popular shared-ownership schemes, it seems that all her dreams are coming true. Then she meets her neighbour (Craig Gazey – Coronation Street); overbearing, brash, and prone to spectacular gaffs, she can’t help but find him strangely attractive. But when an innocent prank goes horribly wrong, the newly-formed friendship is pushed to breaking point. Only then do the neighbours realise they don’t know as much about each other as they thought they did. 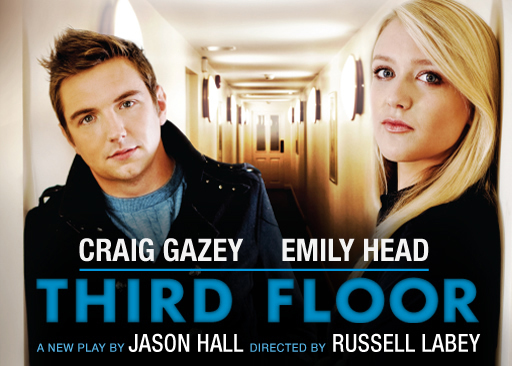 Billed as “a hilarious and unsettling look at urban living today,” Jason Hall’s Third Floor carries a certain degree of expectation which, in turn, led to an initial degree of scepticism on my part. Luckily, it manages to achieve this accolade through fast pace, witty humour and a very unexpected twist. Unusually, for a play with only 2 cast members, we never hear the characters’ names, instead referring to them solely by their flat numbers, a sad but accurate reflection on modern society. The early awkwardness of the first few times they meet is excellently portrayed by both Gazey and Head, who continue to delight as their neighbourly relationship is strengthened and then strained. The awkwardness continues when neither character is quite aware how to react to the problem of rubbish being left in the hallway by the occupant of flat 10 (who we never meet). The set is simple but effective, consisting only of 3 doorways and a stairwell, all leading off the hallway where the action takes place. By halfway through the play, the audience is comfortable in the gentleness of what feels like a rom-com before being thrust into the fast pace and urgency of an almost film-noir concept. The sudden change in tempo is initially startling, but highly effective and reflects the urgency and panic of the situation the characters find themselves in. If I had to gripe about anything, it would be the flashing lights at the scene change. I found these distracting and unnecessary and, although I recognise the feel of them from my own experience of London life, I don’t feel they added anything to this story. Having said that, the playwright, Jason Hall, is definitely one to watch out for. His ability is evident and, with a few tweaks, this could be fantastic. Do go to see this, if only to laugh about it and then feel a bit awkward when you come home to find your neighbour has left her rubbish out in the hallway AGAIN!